Hello and good morning!!! I couldn't be more excited to share a blog post with you than I am today, because we're having a very special blog hop to honor the birthday of one of the sweetest, and most amazing women I've ever had the pleasure to meet!! It's Kathy J's birthday, and I am honored to be a stop on this birthday blog hop to celebrate our Peachy Queen's special day. If you arrived here from the talented Kim's Blog, then you're on the right track, but if not, then please go back to the Peachy Keen Stamps Blog , and hop along from there, so you don't miss one single, amazing creation!! I often tell the story of how excited I was when I first applied for the Peachy Keen Stamps design team. I didn't know much about Peachy Keen Stamps when I applied, other than there was something that immediately drew me to the artwork. I couldn't exactly explain it, at the time, but something about the adorable whimsical images that I saw on the website felt familiar and comfortable to me, and I told my husband that I REALLY wanted to be a Peachy Keen Designer, but I was fairly new to watercoloring, and hadn't touched a Copic marker at that point, so I was afraid to get my hopes up. A few days after I applied, when I had more time to sit down and really check out the PKS website, I found the What's So Funny stamp, and it hit me who Kathy was! I immediately recognized that artwork, because I had painted it many, many times. Kathy had been my tole painting buddy for years, and she didn't even know it. I had purchased Kathy's Paint On A Happy Face books a long time ago, and painted from them (especially Volume 1) till I wore them out, and here, I had literally stumbled upon her website, and I had no idea that she had gone into the stamping business!!! Well, needless to say, that when I received the email that I had been accepted as a designer for PKS, I was way beyond elated!! Talk about surreal!!!!! 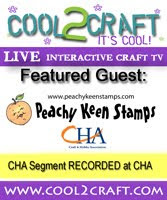 This past July, when I got the opportunity to attend CHA, and work in the Peachy Keen Stamps booth, I was in absolute Heaven!! Not only did I get to meet my crafty hero and her beautiful family in person, but I was blessed to get to meet so many of our wonderful customers, and share what I love by leading make and takes and teaching Copic techniques. It was a dream come true for me, and one that has given me fond memories to last a lifetime. I can never thank Kathy enough for not only the wonderful blessing of the opportunity to design for Peachy Keen Stamps and be a part of the PKS family, but also for a friendship that will last a lifetime and for memories that I hold in my heart forever! Kathy, here's to you on your special day! I hope that your day is one that brings you joy and happiness, and makes you feel loved, because my talented friend... YOU INDEED ARE!!!!!! Thank you from the bottom of my eternally blessed heart for everything, and especially for your friendship. I love ya, Kathy, and HAPPY, HAPPY BIRTHDAY TO YOU!!!!!!! Now, enough of the mushy stuff! *sniff, sniff* On to the card! For Kathy's birthday card, I had to ink up a stamp set from Peachy Keen Stamps, of course that I've had for a while, but hadn't seen ink yet. I knew I wanted to use these cute little kids from the PK-241 Happy Birthday Kids stamp set, and make them look like the members of our family. Everyone in my immediate family has also had the pleasure of meeting Kathy, except for my sons, and I wanted Kathy's birthday card to reflect wishes from the whole bloomin' bunch!! So on this card, are me and Al (had to add glasses for us), Tyler, Cassidy and Baby Max on the left side, and Trevor (complete with goatee, LOL) and his girlfriend, Kallista on the bottom. Everything was colored with my Copic markers, and I added plenty of stickles to the cake, and party hats. There's also a little bling of rhinestones on top of each hat. Thank you so very much for hopping along with us today in celebration of Kathy. Below, please find the blog hop list from start to finish, just in case you get lost along the way! Thanks again, and happy stamping! Your next stop on this hop will be for a visit with Heidi. She's always got something wonderful to share, and I know today she'll knock your socks off! ADORABLE!!!!! Those are just the cutest!!!!! Wow that is just an adorable card for Kathy you are just toot sweet. I absolutley love this card! It is Soooo CuTe! Happy Birthday Kathy! You amaze me my friend. Such talent. Love this card. HAPPY BIRTHDAY KATHY!! Love your creations Looking forward to many more inspirations. HAPPY B DAY KATHY! Woot Woot! great card!! it is so adoravble. happy birthday to kathy! Wow! Great Story thank you so much for sharing. Happy Birthday Kathy! Great Card! TFS. Super cute birthday card. Wishing Kathy a happy birthday. I love all the little Peachy faces on your card for Kathy! Oh yes, I am a follower....I love to follow all you ladies from Peachy Keen. You have such amazing projects on your blogs! What a great card and give away!! Very cute card! I love it! Happy Birthday Kathy! How lucky you are to receive this great card! Lorie, your card is A-mazing! I adore all the little faces colored in so perfectly. I absolutely love what you wrote about Kathy!! And I know she will too!! Beautiful card. Happy Birthday, Kathy. What a cute card. Thanks for sharing with us. Love all the faces. There is something about those little faces. What a great story! What a great card! Love all the faces! Happy Birthday to Kathy! :-) LOVE your super cute card! I just love the faces! Thanks for sharing! Really cute card. Happy Birthday Kathy. I love PK stamps!!!! :) Happy Birthday Kathy! I think it is amazing that you all are doing this for her... she must be one special gal!! Happy Birthday Kathy! Super fun card. Makes me smile. Cute card!! Happy Bday, Kathy! What a special card & story. (I really enjoyed reading the story.) You all (the PK team) do seem to be a close "family". Those little faces are so sweet!!!! You ladies are doing an AWESOME job paying tribute to an AWESOME gal!!!!! OMG....how cute. I love all those little faces. 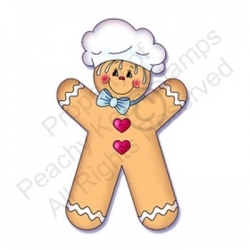 Soooo cute, I love the GingerBread Boys!!! What an adorable card. I just love your copic colouring and I hope to see you do more videos on colouring. Hi! New follower! I found your blog on the hop! What an adorable card!!! Lorie, this is so CUUUTTTEEE! Love how you made it look like your family! Oh my gosh this card is adorable!! Great job. Very talented. I love your card. YOu did an awesome Job. I love the card! too cute... Tell Kathy Happy Birthday! Your card is SO stinkin' cute!!! Happy birthday Kathy!!!! It's funny how things work out sometimes, like they were meant to be. Your card is precious. I love how you represented everyone! Kathy, I hope your day is fantastic! You never seize to amaze me Lorie! This card is amazing! The way you colored it bring it out in a whole different light! Lorie...you are an amazing individual. Such a cute card. I love the family idea. Happy Happy Birthday Kathy!!! You are one loved lady for sure! This card is so adorable..love the family portrait!!! Really cute and I know that she is loving it right now! I love your story about how you came to PK stamps...love that! Sometimes things were meant to happen you know? Thanks! I love the chidren faces, I can't recall seeing them before. Just adorable!! Really adorable. By the way-- I can leave a comment but cannot become a follower--long story but once I figure out how to cancel old accounts, I will. However, you are now bookmarked so I can check in daily and I DO ! This is an adorable card for Kathy...she will definitely love it. What a cute card. Am sure she is gonna love it. What a wonderful story and fabulous Birthday card. Happy Birthday! Wow what a party! What a cute idea for a card. I really lole how you personlized it. Kathy will surely love it. that card is beautiful, just love it. Fabulous card !!! love it ! Those faces are just too cute! Happy birthday Kathy. Love the card. Love your card. Happy Birthday Kathy!!! So super cute! Happy Birthday!!! Awesome card. I am already a follower... thanks for the extra chance for blog candy. Very nice! I love the card! Lorie, I LOVE your cards! You are such an inspiration! I too tole painted and love Kathy's work! I have your gingerbread set and it is SO cute! Everyone loved the cards I did with them! What a great card and friend! Lorie this is so super cute, love these little faces all around the cake. I love it! What a fun card and a great story! Thanks for sharing! I like the whole bloomin bunch. Very cute card and she will love it. Thanks for being in the hop. Wonderful card - love the coloring! It shows how much Kathy means to all of you for you to have this great surprise for her! Wishing you a happy day today and a Happy Birthday to Kathy! Oh Lorie.. she will LOVE it!!! You did an awesome job!! So super cute Kathy will love it ... OK I have to ask where did the glasses come from....My whole family wears glasses....must go search the PKS website!! Thanks for a chance to win a great stamp! What an adorable card! As always, your colouring is Gorgeous! What a fun card :) I absolutely love it! Look at all those cute happy birthday faces. Very cute. Such a cute card!! I know she will love this! Wow Lori! What an adorable card! Kathy is going to LOVE it! Cute little faces!!!! The colors are so vibrant, nice card! Happy Birthday Kathy! That is such a cute card! Wow Lorie! What a great idea--I love it! What a wonderful birthday tribute to Kathy! I know she feels the love. Really neat story and adorable card! Oh my stars how cute!!! Just adorable!!! Love those faces!!! Great birthday card! Thanks for sharing. And I loved reading your story. Thanks for sharing that too. It was very sweet. I can't believe I forgot to leave a comment for you the first time around. It was after 3 A.M. and I hadn't gone to bed yet. Guess my brain was in a fog. Your birthday card is GORGEOUS!!! Absolutely perfect! I love everything about it and I know Kathy will too! lorie, i read your whole story about how you started w the peachy keen family: loved it. tfs w/us. I would love to see that volume 1 of the queen beginnings. It has to be a treasure by now. I also want to say: have a "PEACHY" birthday Kathy! Your card is absolutely adorable!!!! Thanks for sharing!!! So cute. I love the faces. I love how you personalized the card. Too cute! I love this card. What a great idea with the faces. Happy Birthday Kathy!!!! Your card is absolutely adorable. Love all those adorable faces!! I remember tole painting. What a cool story. What a cute card! I am now your newest follower. I found your blog through this hop. This is a great hop idea. Thanks for sharing. Love, Love this card!!! The faces are too cute!! Happy Birthday!! Birthday Wishes to Kathy. This is a real cute Card. I am glad to see the list of people in the blog. I will be check everyone blogs for now on. I really love the Peachy Kings face stamps. I will be ordering after the first of year. This post brought tears to my eyes. It shows the love and admiration you have for Kathy. Lorie your card is just so adorable I love all the little Peachy faces on your card. Thank you so much for sharing your card and story with us all. Lorie - I love your story! The card for Kathy is just adorable! Thanks so much for sharing and for adding you own giveaway - very nice! Happy birthday Kathy! LOTS OF PEACHY LOVE GOING ON,HAPPY BIRTHDAY! Holy Moly your card is AWESOME!!! Awwwwwwwwwwww Our Queen will LOVE it!!!! Sooooo cute!! Thanks for sharing. Absolutely adorable!! How do you do that????? Happy birthday to Kathy! OMG, Lorie! You never cease to amaze me with your copic awesomeness. LOVE this adorable card. Wow - cute - cute - Kathy -you are so lucky to have such great blogs celebrate your birthday with you. Ok I'm stalking you!lol, and I can't wait to see how many Happy Birthday wishes Kathy gets! OH yeah Happy birthday Kathy! Your card is so adorable! Thanks for the chance to win. This is my 1st blog hop and it's so much fun! Your little people are adorable. What a great story! Happy Birthday, Kathy! Super sweet card! This is such a fun hop and I am glad to have the opportunity to participate! Thanks. Oh my word Lorie!! You know JUST the perfect scene for any occasion. This card is unbelievably clever my friend! (Well, actually, in your case, TOTALLY believable)! You've really pushed the boat out on this amazing card and Kathy must surely love it!! !...I do! Love the card. Really cute. Happy birthday Kathy. Great card! great blog candy. Happy Birthday to Kathy. Beautiful like always! I love that your whole family is on it! The Al and Lorie stamps are one of my favorites from the xmas release! So cute! The birthday card is absolutely adorable! Thank you for sharing! What an amazing story of youes and Kathys history! I love her stamps, I would be ecstatic to work there!! Very cute card! Love those faces! Great card!! Love the faces!! Happy Birthday Kathy!!! What a cute card that stamp set made! I so enjoyed reading about your start with Peachy Keen stamps also! LOVE this card, and I'm sure Kathy does too!!!!!!!! This is such a cute card!! Thank you for sharing. Such a cute card. Great way to include the whole family. I am sure this will be a great birthday for Kathy. I loved reading your story about applying for the dt. Thank you for sharing! What a lovely card, those faces are just too cute! TFS! I love your card it is so sweet. I too am drawn to the Peachy Keen stamps. I have yet to get my first set. I have been trying to draw faces for a long time now. I just love how adorable the Peachy Keen Stamps are. Big Cuddle Hugz Birthday Queen. After seeing these cards I'm sure your Birthday is going to be just Peachy! I love your card! All those smiley faces. I love the colors on the card too. TFS! Happy Bday Kathy! Thanks for the hop! I love Peachy Keen! Love the card the cake looks good enough to eat. What an adorable card full of birthday wishes!!!! I love the faces on this card too cute. Your card is adorable! What a way to honor your friend. I love all those little faces you used for The Birthday Girls card, using her wonderful creation! Thank you Kathy & thank you Lorie for sharing your inspiration with us! Contact Info: in case I get a chance to win the amazing blog candy! Happy Holiday's! Thanks for sharing your story! Love your card....and the way you color with your copics!! OBTW - I LOVE the Baker and Patty Cake! very cute card.. i love it.. TFS.. I wish I could shade like that! So pretty! Fantastic card! I'm sure Kathy will love it! Love your card!! Your story is sooo sweet!! OMG too cute! Love the card. Loving the hop and what a great tribute to Kathy. Your card is beautiful. I love the way that the hair is colored. You are very talented. Thank you for sharing! Too CUTE!!!! Love these stamps! Adorable card! 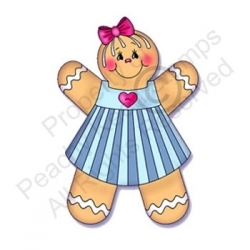 Thanks for the chance to win those cute gingerbread stamps! Adorable card. Great story with it. Thanks for the chance to win some blog candy. Very nice story and really cute card! that is the cutest card!! I love it! I see smiling faces, wishing you a super birthday.